Ligna Lodge is located on the banks of the Sabie River, surrounded by the majestic mountain vistas of Sabie. This lodge consists of various accommodation types such as the pool facing luxury rooms, which is equipped with their own balcony and tea and coffee facilities. The river facing rooms which are equipped with a lounge area, a fireplace and tea and coffee facilities and the log cabins which are equipped with an open-plan lounge, a fireplace, a dining room and a fully equipped kitchen. The village offers many activities such as hiking, mountain biking, bird watching, riverside picnics, riverside braais, horse riding, golf, squash and guided tours to the Kruger Park. Yes, I enjoyed my stay. The staff was very friendly and assisting more especially Aaron. Thumbs up A. I loved the weather in Sabie. The food was great too! Keep up the good work!! The lodge is a welcome sight just out of Sabie Town. 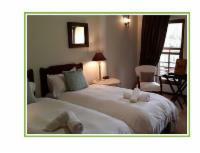 It is built right on the Sabie river which adds a good calm vibe to the lodge. The lodge needs to be staffed better, we had to ring for help at arrival and had to look for staff at dinner time to serve us. But overall the service was good once we were attended to.River cabins are a nice size. May need a slight revamp to move it into a modern feel, as some paint is needed and new tiling, but overall it was a great chalet, with all the amenities you need.Will definitely come back! A beautiful lodge with a friendly staff. The lodge was clean and the with the meal portions were big :) Loved every minute and will definitely comeback with the family. The river in the backyard adds that extra special touch by the picnic area. The place was clean and very nice except i requested B&B rate which was not so we had to pay extra for breakfast. The waitron asked us not to include a gratuity in the EFT because they never get paid out. The food prices were high. Ligna Lodge is 1.3km from the centre of Sabie , the nearest airport 48.7km (Kruger Mpumalanga International Airport).